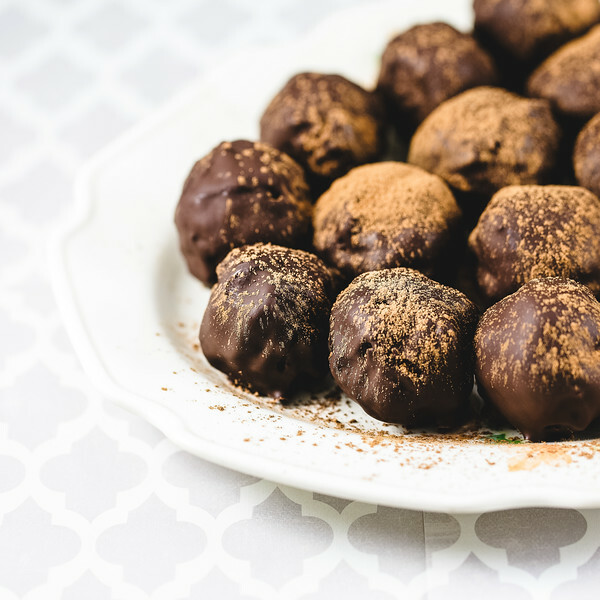 Dark Chocolate Rum Truffles – step aside bourbon balls, rum balls are back in town! These dark chocolate rum balls are filled with intense dark chocolate flavor and of course rum! Dark chocolate, holiday cake or fruit bread, rum, and cocoa powder are all you need to make these! 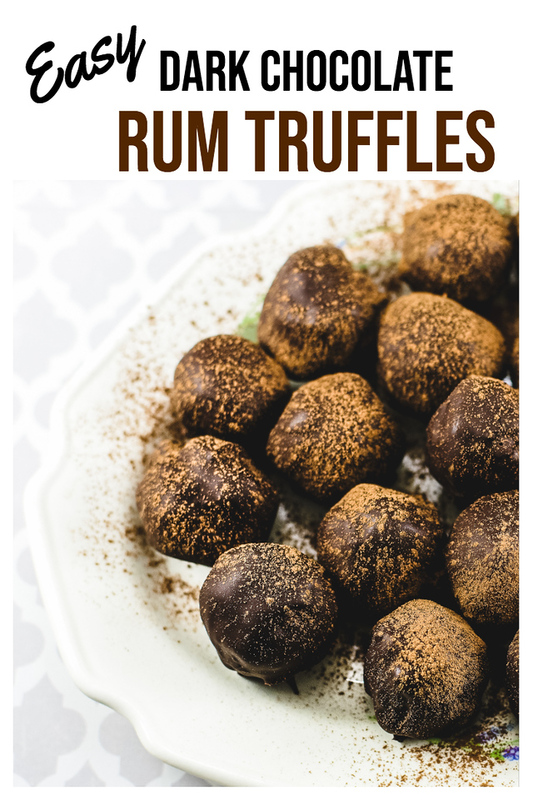 Click here to pin these Dark Chocolate Rum Truffles now! I admit it, I love truffles. I love that they are somewhat portioned controlled (though not really in my case!) They are so easy and so crazy delicious. I went searching through some old magazines and found that I had marked the Dec-Jan 2014 issue of Donna Hay magazine. Look at the four options she has for quick fix truffles: Dark Chocolate and Rum Truffles, Amaretti Cranberry and Clementine Truffles, Date Raisin and Hazelnut Liqueur Truffles, and Madeira Cake Cherry and White Chocolate Truffles. Personally I think a worthwhile goal would be to work my way through all of them, don’t you agree? I’m pretty sure you’re going to want to make them all, because after you try just one, you’re hooked. I started out with the dark chocolate and rum ones. Why? Um…dark chocolate…rum…? I’m there! These were so good and so easy! She calls for 10 ounces of fruitcake, I couldn’t really find any fruitcake, so I subbed a cranberry walnut bread. Not a toasting bread, but one that had a rich moist consistency like a banana bread. It was perfect! These are really rich and one truffle is oh-so-satisfying! These are perfect for Christmas or Valentine’s Day or let’s say any Wednesday! For Christmas, you could use any sort of fruit cake, panetonne, or like I mentioned above a cranberry walnut bread. For Valentine’s Day, a red velvet cake would be perfect! For that Wednesday when you desperately need a truffle, wouldn’t a banana bread be good! With few ingredients, you want to use a good quality chocolate and a good quality cocoa powder. If you want to be totally decadent, serve these with this Chocolate Coffee Martini because too much chocolate is not possible! Dark Chocolate and Rum make these Dark Chocolate Rum Truffles extra amazing! Place the fruit cake and rum in a food processor. Process until combined. Place in a bowl and pour over the 7.5 ounces of dark chocolate. Mix to combine. Refrigerate for 30 minutes - don't go any longer because the chocolate will become too firm to shape. Shape into 1 1/2 inch balls. Using two forks, dip the truffles into the melted chocolate. Place on a lightly greased wired rack placed on top of a baking sheet lined with non stick baking paper. Refrigerate one hour or until set. Dust with cocoa before serving. I think I’ll be giving the Date, Raisin and Hazelnut ones a try but substituting prunes for the dates. It is the perfect combination! This sounds amazing! I never would have guessed that fruitcake is a base. Fruitcake has a seriously bad reputation, but I feel like it’s so underrated. I’m going to have to try these! Any good moist cake or bread would work! Dark chocolate and Rum, I’m hooked! What a great idea for all sorts of occasions using different cakes. I know, I can think of lots of ways to enjoy these! I think truffles are the easiest Christmas gifts you can make for the holidays. I mean talk about how easy this is. My favorite is RUM.. yum. I know, they are crazy easy! These truffles look so delicious and I love that they are made with fruitcake! So festive. Can’t wait to try these. You’ll have to let me know what you think! You’re right – I would like to make all of those, but chocolate and rum seems like a good place to start. Actually the Christmas cake I made this year was a bit ordinary, so I think the remains of it might be headed for some of these truffles. Oh, yum!! I haven’t made truffles in AGES. These look perfect for gifting! Or keeping!! Rum and chocolate is always a welcome pair at any Christmas gathering, right? I would say so, and these look like they would fly off the treat trays in no time! I love rum in bakes! And these looks wonderful! It would be difficult to stop at just one or two! Where is Pam the Rebel this week 🙂 Truffles are the most decadent and wonderful treats ever. Love that these actually have fruitcake/cranberry bread in them. That’s definitely unique. Fruitcake truffles sound so good! These sound fabulous. It’s so unusual that cake is used in the recipe. fruitcake crumbs? what?! what a marvelous truffle idea! These sound so good. I love fruitcake but can never get anyone to eat it. I bet they will now! How different with the fruit cake! Chocolate and rum. What’s not to love, especially if relatives or boring guests have arrived? Perfect! Delicious! Those truffles look/sound divine. I would have a hard time not popping one of these in my mouth each time I passed by the plate.